Terrence Jon Francona (born April 22, 1959), nicknamed "Tito", is the manager of the Cleveland Indians of Major League Baseball (MLB). Previously, he was the manager of the Boston Red Sox, whom he led to two World Series titles, ending the franchise's 86-year championship drought. After an unsuccessful four-year stint as the manager of the Philadelphia Phillies, Francona was hired to manage the Red Sox in 2004 and led the team to their first championship since 1918. He won another World Series with Boston in 2007 and continued to manage the team until the end of the 2011 season, where his contract wasn't renewed following a September collapse. In 2013, Francona was hired to manage the Cleveland Indians and led them to an American League pennant in 2016. In August and September 2017, he led the Indians to a 22-game win streak, the longest win streak in American League history and the longest without ties in MLB history. Francona was born on April 22, 1959, in Aberdeen, South Dakota to Tito Francona (1933-2018), who played outfield for several Major League clubs from 1956 to 1970, and Roberta Jackson (1932–1992). 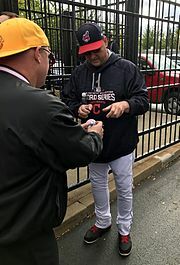 Francona grew up in New Brighton, Pennsylvania, about 30 miles (48 km) northwest of Pittsburgh, where he got his start in baseball at New Brighton Area High School. Francona represented the United States at the 1979 Pan American Games and attended the University of Arizona, where he played college baseball for the Arizona Wildcats baseball team. Francona and the Arizona Wildcats won the 1980 College World Series and Francona was named the tournament's Most Outstanding Player. Francona won the 1980 Golden Spikes Award. Francona was drafted in the first round of the 1980 amateur draft by the Montreal Expos, using the 22nd overall selection. After briefly playing in the minor leagues, Francona made his major league debut with Montreal on August 19, 1981, a week after the end of that summer's player strike. He appeared mainly as an outfielder that first year, and he went 4-for-12 in the National League Division Series against the Philadelphia Phillies, an extra playoff round utilized that year because the season was conducted in two halves as the result of the strike. The Expos won that series, three games to two. As the seasons went on, Francona shifted to first base, where he ultimately played one hundred games more than he had in the outfield. He also developed a reputation as a contact hitter, with very few home runs, walks, or strikeouts. The Expos released Francona after the 1985 season, during which his batting average had slipped to .267 after posting a .346 average in limited action in 1984. He went on to sign one-year contracts with the Chicago Cubs, Cincinnati Reds, Cleveland Indians, and Milwaukee Brewers. The Brewers re-signed Francona for 1990, but he only played in three games for the Brewers that year, the last on April 19. In 10 seasons and 708 games, he posted a .274 career average, with 16 home runs and 143 RBIs. He also made an appearance as a pitcher with Milwaukee on May 15, 1989, throwing 12 pitches and striking out one batter (Stan Javier) on three pitches. After retiring as a player, Francona began coaching, spending several years in the Chicago White Sox organization. In 1991, he managed the rookie league Sarasota White Sox of the Gulf Coast League. In 1992, he ran the South Bend White Sox of the mid-level Class A Midwest League. As manager of the AA franchise Birmingham Barons in 1993–95, he posted a 223-203 record and won two distinctions: Southern League Manager of the Year in 1993, Baseball America's Minor League Manager of the Year in 1993, and top managerial candidate by Baseball America in 1994, the same year Michael Jordan played for Birmingham. Birmingham won the Southern League championship in 1993. He managed in the Dominican Winter League with the Águilas Cibaeñas, and he also won the championship and the Serie del Caribe in 1995–96. That team included Miguel Tejada, Manny Ramirez, and Tony Batista. Francona became third-base coach for the Detroit Tigers in 1996, working under their new skipper, Buddy Bell, a former teammate of Francona on the Reds. After the 1996 season ended, he was hired as manager of the Phillies, who had won the NL pennant in 1993 but then had three consecutive losing seasons. In Francona's four seasons (1997 through 2000) as the Phils' skipper, the club never rose above third place in the National League East. His best finish with the Phillies was 77–85 in 1999. In 1998 and 1999, the Phillies finished in third place, behind the Atlanta Braves and their division-rival New York Mets. He was fired following the 2000 campaign. He finished with a 285–363 record. He spent the following season as a special assistant to the general manager with the Cleveland Indians in 2001, which was followed by two one-year terms as a bench coach for the Texas Rangers (2002) and Oakland Athletics (2003). The Red Sox hired Francona to manage their club in 2004, after Grady Little's contract was not renewed following the Red Sox loss in the 2003 American League Championship Series. Francona led the Red Sox to a 98–64 record in 2004, the second-best record in the American League behind their biggest rival, the New York Yankees. The club gelled in the second half and won more games than any other team in the American League after the All-Star break. As the American League wild card, the Red Sox swept the AL West champion Anaheim Angels, three games to none, in the Division Series. In the 2004 American League Championship Series, the Red Sox fell behind the Yankees, three games to none, including a 19–8 loss in Game 3 at home in Fenway Park. However, the club regained its composure and won the last four games of the series, the first time in Major League Baseball history that a team rallied from an 0–3 deficit to win a playoff series (only the third team to even make it as far as Game 6, and the only team to even force a Game 7 after trailing a series three games to zero). The Red Sox then swept the St. Louis Cardinals 4–0 in the 2004 World Series to win the sixth world title in franchise history, and their first since 1918. The long-awaited victory ended 86 years of frustration for Red Sox fans. During the 2005 season, Francona was hospitalized after complaining of severe chest pains. Tests revealed significantly clogged arteries, but it was concluded that Francona had not suffered a heart attack. This incident, as well as a life-threatening pulmonary embolism suffered in 2002, painful knees, and ongoing treatment for blood clots, has led to circulation issues which necessitate wearing extra clothes, including two pairs of tights. This is also why his regular uniform top is usually hidden by a pullover. Two years later, the Sox won the AL East Division, finishing two games ahead of the Yankees. Under Francona's leadership, the Sox swept the Angels in the Division Series before dropping three of the first four games to the Cleveland Indians in the ALCS. The Sox, facing elimination, went on to win their next three games, defeating Cleveland to advance to the 2007 World Series, where they swept the Colorado Rockies in four games. Terry Francona is the only manager in Major League history to win his first eight consecutive World Series games and just the second manager to guide two Red Sox clubs to World Series titles, the other being Bill "Rough" Carrigan who led Boston to back-to-back championships in 1915 and 1916. As of October 1, 2008, Francona's career regular-season managerial record was 755–703 (.518), while his post-season record was 22–9 (.710). Among managers who have managed at least 20 post-season games, he has the highest winning percentage. Francona won his first seven playoff elimination games (not losing until being swept by the Chicago White Sox in the 2005 ALDS) and first nine ALCS elimination games (not losing until Game 7 of the 2008 ALCS at the Tampa Bay Rays). On February 24, 2008, the Red Sox announced that they had extended Francona's contract. Instead of expiring at the end of the 2008 season, it would expire after the 2011 season. The team also held club options for 2012 and 2013. Francona was guaranteed a total of $12 million over the first three years of the contract, plus a $750,000 buyout to be received if his 2012 and 2013 options were not exercised. On June 2, 2009, Francona recorded his 500th win as manager of the Red Sox, making him the third manager in club history to have 500 wins. The only other two to win at least 500 games as manager of the Red Sox are Joe Cronin (1,071), and Pinky Higgins (560). On May 6, 2010, Francona became the fourth person to manage 1,000 games for the Red Sox. On July 23, 2011, Francona got his 1,000th win as a manager, but his team collapsed historically in September, finishing 7–20 and squandering a nine-game lead over the Rays for the AL Wild Card spot. Following the season, the Red Sox declined to exercise Francona's 2012 option. He finished his Red Sox career with a 744–552 record in the regular season—second to Cronin in victories, but tops in winning percentage (.574) among those of manage at least 750 games—and 28–17 (.622) in the postseason with those two World Series championships. Francona was hired as manager of the Cleveland Indians on October 6, 2012, and officially introduced on October 8. The Indians chose Francona over Sandy Alomar Jr., who had served as the club's interim manager for the final six games of the 2012 season after Manny Acta was fired on September 27. Francona and Alomar, who had spent the past three seasons as a coach in Cleveland, were the only candidates interviewed for the Indians' opening. Alomar stayed in Cleveland in Francona's staff as the bench coach. Under Francona, the Cleveland Indians finished the 2013 regular season with a record of 92-70, which was a 24-game improvement over the previous year. The Indians were eliminated from the 2013 MLB playoffs by losing 4-0 to the Tampa Bay Rays in the American League Wild Card Game. On November 12, 2013, Terry Francona was named as the American League Manager of the Year. Francona agreed to a two-year extension on November 4, 2014. He led the team to a 177-147 record in his first two seasons as Indians manager. Francona managed the Indians to the American League Central Division title in 2016. His team swept his former club, the Boston Red Sox, in three games in the divisional series—clinching a berth in the ALCS with a win at Fenway Park on October 10, 2016. On October 19, 2016, Terry Francona's Indians beat the Toronto Blue Jays to move on to the World Series, where the Indians won game 1 against the Chicago Cubs 6-0 to extend his World Series record to 9–0. He lost his first World Series game when the Indians were defeated by the Cubs in game 2 by a score of 5–1. The Indians won game 3 against the Chicago Cubs 1–0. The Indians won game 4 against the Chicago Cubs 7–2 to give Cleveland a 3–1 lead. The Indians would fall to the Cubs 3–2 in game 5. Cleveland went on to lose Game 6 by a score of 9–3, then lose 8–7 in 10 innings in Game 7 handing Francona his first World Series loss. 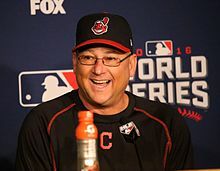 On November 15, 2016, Francona was named American League Manager of the Year for the second time in his career. Cleveland turned in another successful season in 2017, with Francona undergoing a cardiac ablation. The highlight of the season was a 22-game win streak that spanned August 24−September 15. Of historic proportions, the streak placed second longest all-time in major league history to the New York Giants' 26 consecutive (included ties and suspended games) in 1916. It surpassed the 2002 Oakland Athletics' 20 consecutive wins for the American League record. Dominant in all aspects, the Indians trailed at the end of just eight of the 199 innings, and their run-differential of plus-105 (142−37) was higher than all but six teams through that point in the entire 2017 season. The offense produced a .937 OPS, 54 points higher the next best team, the Twins. The Indians' 1.58 ERA scaled 1.15 points lower than the next-best club, the Arizona Diamondbacks. Their Central division lead over the second-place Twins swelled from ​4 1⁄2 games to ​13 1⁄2 games. As of games played on October 8, 2018. Following his departure from the Red Sox in 2011, Francona was employed by the Fox network as a substitute color analyst for the first two games of the American League Championship Series. Francona, who teamed with play-by-play announcer Joe Buck, filled in for regular Fox analyst Tim McCarver, who was recuperating from minor heart surgery. On December 5, 2011, Francona signed with ESPN joining their Sunday Night Baseball telecast, replacing Bobby Valentine, who himself replaced Francona as manager of the Red Sox. During the 2012 season, he worked as an analyst on Sunday Night Baseball, contributed to ESPN.com, and contributed to ESPN's Little League World Series coverage. Francona dearly thanked ESPN as he left for the job as Cleveland Indians manager. Francona married Jacque Lang on January 9, 1982, and they have four children: son Nicholas, and daughters Alyssa, Leah, and Jamie. Nick played collegiate baseball for the University of Pennsylvania and for a time in the Cape Cod Baseball League. He was a lieutenant in the United States Marine Corps. In 2003, Nick was drafted by the Boston Red Sox. Alyssa and Leah played on the University of North Carolina softball team. In 2009, Alyssa was a senior and Leah was a freshman on the team. Jamie currently attends the United States Naval Academy. It was revealed in October 2011, that Francona and Lang had recently separated and that Francona had been living in a hotel room during the baseball season. Francona later admitted that he and Lang were in the final stages of divorcing. He is known for his ever-present wad of chew. Francona and Indians' bench coach Brad Mills have been best friends since their college playing days and have coached together on the Phillies, Red Sox and Indians. Francona's mother, Roberta, died in 1992. His father, Tito, died in 2018. During the months of June and July 2017, Francona missed several games due to feeling lightheaded. He was admitted to the Cleveland Clinic to undergo a series of tests. On July 7, 2017, it was announced that Francona underwent a catheter ablation to correct an irregular heartbeat. Because of the recovery period from the procedure, Francona had to skip the 2017 MLB All-Star Game, which he was due to coach. On July 8, 2017, he was released from the hospital and expected to rest until July 14, 2017, when the Indians start the second half of the season. ^ McDaniel, Randy (October 31, 2016). "Indians Manager Terry Francona Was Born In Aberdeen South Dakota". KXRB. Sioux Falls, South Dakota: Townsquare Media. Retrieved July 8, 2017. ^ "Tito Francona Statistics". Baseball-Reference.com. United States: Sports Reference LLC. Retrieved July 8, 2017. ^ Davis, Elliott (June 25, 2011). "New Brighton, Pa., Native Terry Francona Managing in Pittsburgh for First Time Since 2000". NESN. ^ Golen, Jimmy (December 4, 2003). 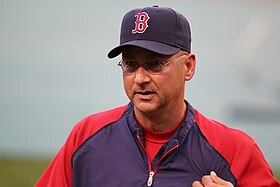 "New Brighton's Terry Francona to be named manager of the Red Sox". Beaver County Times (The Associated Press). ^ "1979 Pan American Games (Rosters)". Baseball-Reference.com. Sports Reference, LLC. Retrieved September 28, 2017. ^ "Shocks' Dreifort chosen for Golden Spikes award". Lawrence Journal-World. Associated Press. October 28, 1993. p. 4C. Retrieved August 5, 2012. ^ "Milwaukee Brewers at Oakland Athletics Box Score and Play by Play". Baseball-Reference.com. United States: Sports Reference LLC. May 15, 1989. Retrieved July 9, 2017. ^ a b c "Terry Francona". Baseball-Reference.com. United States: Sports Reference LLC. Retrieved December 20, 2014. ^ Wulf, Steve. "Terry Francona". ESPN the Magazine. ESPN Internet Ventures. Retrieved August 31, 2009. ^ Crasnick, Jerry (August 31, 2007). "MLB Acknowledges In-Game Uniform Check Timed Poorly". Retrieved August 31, 2009. ^ Browne, Ian (February 24, 2008). "Red Sox extend Francona's contract". redsox.com. MLB.com. Retrieved August 31, 2009. ^ Edes, Gordon (February 24, 2008). "Updated info on Tito's deal". Boston Globe. Retrieved August 31, 2009. ^ "Boston Red Sox Managers". Baseball-Reference.com. United States: Sports Reference LLC. Retrieved July 9, 2017. ^ McDonald, Joe (September 30, 2011). "Terry Francona, Red Sox split". ESPNBoston.com. Retrieved October 1, 2011. ^ Shaughnessy, Dan (October 1, 2011). "Ignore the spin – Red Sox fired Francona". The Boston Globe. Boston: Boston Globe Media Partners, LLC. p. A1. Retrieved April 6, 2013. ^ "Terry Francona named new manager of Cleveland Indians". Espn.go.com. October 6, 2012. Retrieved March 6, 2013. ^ "Indians hire Francona as next manager". Usatoday.com. October 7, 2012. Retrieved March 6, 2013. ^ "Indians, Francona agree to 2-year extension". ESPN.com. United States: ESPN. Associated Press. November 4, 2014. Retrieved November 4, 2014. ^ "Terry Francona magnificent in guiding Cleveland Indians to AL Central title: DMan video". Retrieved November 3, 2016. ^ "Cleveland Indians sweep Boston Red Sox to clinch ALDS; face Toronto in ALCS on Friday". Retrieved November 3, 2016. ^ Oz, Mike (November 15, 2016). "Francona named 2016 AL Manager of the Year". Yahoo Sports. Retrieved November 15, 2016. ^ Castrovince, Anthony (September 16, 2017). "Let's honor The Streak with some awards". MLB.com. Retrieved September 16, 2017. ^ Hiestand, Michael (October 5, 2011). "Terry Francona replaces Fox's Tim McCarver for ALCS games 1, 2". USA Today. ^ "Reflections on NFL, ESPN, FinishLine.com and The New York Giants". Archived from the original on July 19, 2012. Retrieved November 3, 2016. ^ "Terry Francona biography". Boston.com. Retrieved August 31, 2009. ^ "Nick Francona bio". pennathletics.com. Archived from the original on July 19, 2011. Retrieved August 31, 2009. ^ "Francona to miss Friday game for son's Marine graduation". The Providence Journal. Providence, Rhode Island: Blogger. March 19, 2009. Archived from the original on July 3, 2009. Retrieved July 9, 2017. ^ Shaughnessy, Dan (October 31, 2004). "Terry Francona, the nice guy who finished first". The Boston Globe. Boston: Boston Globe Media Partners, LLC. Retrieved July 9, 2017. ^ "Alyssa Francona". College Sports Television. New York City: CBS Corporation. Retrieved August 31, 2009. ^ "Leah Francona". College Sports Television. New York City: CBS Corporation. Retrieved August 31, 2009. ^ "A Conversation with Terry Francona, Part Four". ^ Wisnia, Saul (May 27, 2013). "The One Annoying Thing About Indians Manager Terry Francona". Bleacher Report. ^ Associated Press (June 17, 2008). "Francona wants to come home". The Bismarck Tribune. Bismarck, North Dakota: Lee Enterprises. Retrieved July 8, 2017. ^ Associated Press (June 27, 2017). "Indians manager Terry Francona hospitalized, will miss game". The Washington Post. Washington, D.C.: Nash Holdings LLC. Retrieved July 8, 2017. ^ Associated Press (July 5, 2017). "Terry Francona still in hospital undergoing tests". Boston.com. Boston: Boston Globe Electronic Publishing Inc. Retrieved July 9, 2017. ^ "Terry Francona undergoes heart procedure, out for All-Star Game". ESPN.com. United States: ESPN Inc. July 7, 2017. Retrieved July 8, 2017. ^ Associated Press (July 8, 2017). "Indians manager Terry Francona out of hospital after heart procedure". USA Today. McLean, Virginia: Gannett Company. Retrieved July 9, 2017. Wikimedia Commons has media related to Terry Francona.